It’s as if fate has been against Littlefoot for most of his young life. But every obstacle he’s faced has been overcome, whether through his own determination, or through the help of the humans who are on his side. Littlefoot is an orphaned grizzly whose mother was shot last year near Fernie, British Columbia. He was forced to hibernate on his own last winter, a hardship that would kill most bears his age. This spring he was found roaming around a ski hill near Fernie, severely malnourished and underweight—but alive. In partnership with the Government of British Columbia and IFAW, the Northern Lights Wildlife Society is the only organization permitted to rehabilitate and release grizzlies in the province, and the only one ever to track their movements after release. 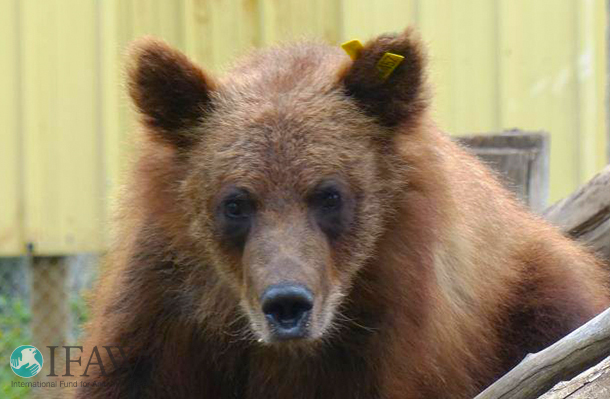 IFAW helps orphaned bears in Russia, too. Watch this video about the Orphan Bear Rescue Project. So when Conservation Officer Joe Garay found Littlefoot in June, he called us and asked if we could help. The BC Government quickly gave their approval to take in Littlefoot, even though he is the first yearling to be accepted into the project. We jumped in our truck and drove the 1300 kilometres to Fernie as quickly as we could. There, we loaded the tranquilized bear into our specialized transport trailer, and headed back to Smithers to begin Littlefoot’s rehabilitation. Once we had him loaded into his enclosure, it was clear that the only thing on his mind was food—and for good reason! Grizzly cubs stay with their mothers for two to three years for protection, and for the food that their mothers share with them. But we had to be extremely careful not to overfeed Littlefoot, which can provoke protein shock. He wasn’t very happy with his small portions, but soon enough he was getting full-sized meals, and his playful, mischievous personality began to shine. As his principal caregiver, I was the only human providing him with food. Whenever he was given a fish, he would run around his enclosure with it, throwing it in the air and catching it, and somersaulting with it. In order to provide stimulation during their time with us, we don’t simply feed the bears in our care; we carefully hide food around their enclosure to stimulate their natural tendencies to forage for food. We were also very attentive to Littlefoot’s need for exercise. Obviously providing him with the nourishment he needs is important—but we don’t want him to just get fat! If he is to have a chance at survival in the wild, he needs to be strong. So we provided him with logs to tear into, and his enclosure is large enough that he could sprint around at quite a clip. After just two months in our care, Littlefoot had grown from a measly 49 pounds to a healthy 144 pounds. We knew it was time to release Littlefoot when he began showing signs that he wanted out of his enclosure — trying to dig under the fence, and being restless. It’s almost as if Littlefoot, like the rest of the bears we’ve cared for over the years, knows when there’s a good berry crop in the bush for him to eat. First the battery for his satellite collar, which we had ordered from Germany a month prior to his planned release, simply refused to arrive. Then just as we had developed a solution using the materials we had on hand, forest fires struck, closing the highways and leaving us wondering if we would have to evacuate. Thankfully the fires were quenched, and we were given the green light to travel to his release site outside of Cranbrook, BC. Joe Garay, the same Conservation Officer who had first found Littlefoot, led our team to a secluded spot far from people and with plenty of food for Littlefoot to eat. He was very happy to see Littlefoot on his way back to freedom. When it came time to open Littlefoot’s trailer, he immediately jumped right out. But just like most wild animals who have been in human care for any extended period of time, he didn’t immediately run into the bush. He wasn’t sure whether there was a fence around him still! After some time digging for grubs and rolling in the grass, he saw something on the hillside and it was as if he finally realized he was free once more. Off he ran to investigate, dig, roll, play, and graze. We watched him as he made his way up the hill and into the distance, knowing we had given him the best chance at surviving in the wild, and wishing him the best. Since Littlefoot’s release, his satellite collar has come online. His movements match typical juvenile grizzly behavior, wandering across mountains, and staying in the high alpine where there are plenty of berries for him to eat while he fattens up for another hibernation on his own. We’ll miss Littlefoot’s playful energy, but at the Northern Lights Wildlife Society, just like at IFAW, we know that wild animals belong in the wild. Angelika Langen co-founded the Northern Lights Wildlife Society in Smithers, British Columbia, Canada with her husband Peter in 1990. There they rehabilitate all kinds of wildlife in trouble, from playful river otters to stoic moose.